Last month in conjunction with CERAWeek, the Wall Street Journal published a Special Advertising Feature by Xizhou Zhou, “How China’s Anti-Smog Campaign Triggered a Natural Gas Crisis and a Switch to ‘Clean Coal’,” (March 7, 2018). During the winter of 2012-13, media outlets across the world covered the “airpocalypse” that blanketed Beijing and surrounding regions. Photos of people walking dogs on leashes—but who couldn’t quite see their pets—surfaced on social media. The increasingly affluent Chinese public demanded relief, and the central government acted swiftly, issuing a sweeping “Action Plan on Prevention and Control of Air Pollution.” The aim was to achieve real results in five years. National oil companies made major refinery upgrades and met aggressive new fuel standards. Power companies completed retrofits for over 800 gigawatts of coal plants, meeting emissions limits more stringent than the latest U.S. EPA rules. And they shut down the vast majority of their old, inefficient coal plants, whose capacity totaled more than 100 gigawatts—enough to power France. China’s coal-fired power generation fleet is now among the world’s most efficient. During this period, China also emerged as the largest market for wind turbines and solar panels. Gas-fired power generation capacity grew rapidly as well, reaching 76 gigawatts by the end of 2017. In early 2017, the Ministry of Environmental Protection (MEP) recognized there were only a few short months left to meet the deadlines set out in the Action Plan. They had to look for emission reductions in new places. 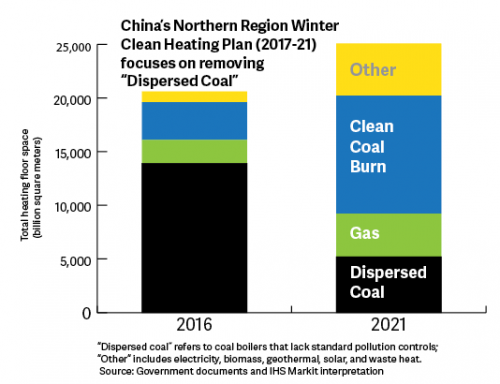 Officials zeroed in on the last unregulated sector, known as “dispersed coal”—tens of thousands of coal boilers that provided industrial steam, process heat, and residential heating in northern China. These small facilities, spread across many provinces, burned low-quality coal and lacked basic pollution control equipment. But dispersed coal provided 70 percent of northern China’s heating. Starting in the spring of 2017, officials issued orders to shut down these facilities, and—when they did not trust the operator to stay closed—even hired crews to dismantle the equipment. Local cadres quickly fell in line and sent a firm message to facility owners: switch to gas or stop operating. This did the trick. As the heating season began in November 2017, northern China’s residents experienced consecutive blue sky days, without even a yellow alert. Many first-time visitors to the Chinese capital wondered where the infamous Beijing smog had gone. There was, however, a problem: many communities were literally left in the cold. Their boilers could no longer burn coal, but there wasn’t enough natural gas. The situation quickly escalated, and reports circulated of school children sitting in freezing classrooms and surgical procedures delayed because of frigid temperatures in hospitals. What had not been understood was that China lacked the underground gas storage to manage seasonal demand fluctuations—certainly not at the scale needed by the 2017 coal-to-gas conversion campaign. China was experiencing a natural gas crisis. To many people’s surprise, the most important source identified in the [Action Plan on Prevention and Control of Air Pollution] was “clean coal burning.” This meant large, centralized coal facilities equipped with state-of-the-art pollution controls. The vast majority of China’s coal-fired electric power plants fall into that category today. Over the next four years, the government will continue to allow more combined heat and power coal plants to operate in northern China. As a result, floor space heated by “clean coal burning” is projected to more than triple by 2021 (see chart). Substitution of this kind will actually reduce overall coal consumption, because large plants are more efficient than dispersed small boilers. It will also lower the associated carbon emissions. Gas remains part of the solution, but not as much as clean coal. By 2021, gas is projected to account for 16 percent of floor space heated, compared with 44 percent for clean coal. The plan also stipulates that other heating sources should be considered when possible, including biomass, geothermal, and electricity. The Clean Heating Plan thus pursues an “all-of-the-above” strategy that relies on any source of energy with zero or low emissions. The 2017-18 natural gas crisis resulted from China’s aggressive efforts to curb air pollution and an initial assumption it could rely mostly on switching from coal to gas. The infrastructure required to make a wholesale switch like this was not yet in place, leading to a shift. China’s new strategy is to rely mostly on a switch from “dispersed coal” to clean coal, bolstered by generous doses of natural gas and all of the above—and more natural gas storage.